World Darts Championships - Christian “Ian” Perez did it again !! Christian “Ian” Perez did it again !! 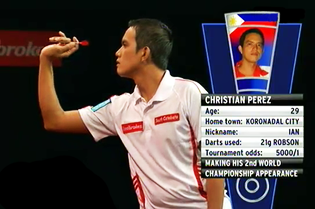 Christian “Ian” Perez, the NDFP no.1 ranked player and the Philippine Qualifier to the World Darts Championship in London, again duplicated his 2009 World Darts Championship performance by winning the preliminary round and continues to be the only Filipino player to have won a match in the World Darts Championships. Ian Perez dominated Dieter Burger 4-0 in the preliminary round of the World Darts Championship last December 17, 2011 at the Alexandra Palace in London. In the opening leg of the best of 7 legs, Ian Perez set the tone of the match with a 110 out hitting T20-S18-D16. From there on Ian coasted along for the victory. Both players previously played in the World Darts Championship where Ian came through a nerve wracking decision game with a 12-dart out versus perennial qualifier from Denmark, Brent Larsen in 2009. Dieter Burger is on his 2nd consecutive appearance as the Eastern European Qualifier. Later in the afternoon on the same date, Ian Perez played the no.24 ranked player of the Professional Dart Corporation (PDC) and the 2007 WDC quarter-finalist Alan Tabern in the best of 5 sets best of 5 legs in the top 64 match. Tabern was heavily favored to sweep the match 3-0 sets and betting odds of winning at 1/6 compared with 7/2 odds for Perez. Tabern started the 1st leg where Perez has a chance to win against the throw. With 140, Perez threw T20-T20 and a heart breaking miss on the D10. In the 2nd leg, Ian threw a 13-darter to even the legs. Tabern won the next two legs and wrapped up the 1st set. The 2nd set started with Ian winning the 1st leg. Tabern threw 4 consecutive wins to wrap up the set and the 1st leg of the 3rd set. Not to be outdone Ian Perez countered with 4 consecutive wins to win the 3rd set and the 1st leg of the 4th set. By this time, Tabern was already showing signs of frustration and pressure. Alternative wins followed and reached 2 legs apiece. In the deciding leg of the 4th set, with 56 left Ian threw S16 and missed D20 and D10. This could have been for the winning set and to play for the deciding set. Tabern with 122 remaining threw T18-S18-Dbull for the match victory – a heart-breaking loss for Ian. Match statistics were close as shown by the dart averages and the number of high scores. Tabern outclassed Perez in the High Outs of the match with 149-122-121 outs. Despite the loss, Ian gave a good impression to the announcer and annotator of the TV coverage with remarks such as “Ian is one of the best qualifiers for this year”. And, had he reached the deciding set, he could have been the talk of the darting community. Eventually, as the announcers noted, experience prevailed.